Corruption, corporate social responsibility and reputation management — you might think these words are exclusive to the business world. But David Chan Smith, a Wilfrid Laurier University associate professor of history, is proving otherwise, offering new insight into the legal relevance and evolution of these concepts by reconstructing their history. Smith is a historian and interdisciplinary scholar who joined Laurier just over five years ago, after finishing his PhD and role as dean of Kirkland House at Harvard University. As a member of Laurier’s Department of History, he teaches business and intellectual history that explores the roots of inequality in capitalism. In his forthcoming book, The Invisible Handshake: Discovering Corruption in Early Modern England, Smith is piecing together a new history of corruption through the lens, life and legal documents of Sir Stephen Proctor. A 17th-century corruption hunter, Proctor was a rising entrepreneurial figure at a time of religious tension during the English reformation. His career enables us to see how people made a living profiting from corruption. But this charge against Catholics, who were by and large loyal subjects, led to political instability. “Reputation is still in its early days as a field of management." While there has been debate over whether or not people in the 17th-century had conceptualized political corruption, Smith’s research on Proctor’s other business prosecuting embezzlement and abuses by office holders illustrates that corruption was, indeed, thought of as widespread and dangerous. But contemporaries often disagreed about what amounted to corrupt behaviour. “Much of what people identified as corrupt was actually just political compromise — a certain amount of money taken under the table by unpaid office holders was permitted,” says Smith. Prosecuting this “corruption” disrupted these compromises, and led to political turmoil. Proctor’s enemies eventually conspired successfully to destroy him. Corruption, then as now, was also harmful. “A close examination of Proctor’s era shows that over time, corruption was costing the Crown significant amounts of money — and the diversion of this money created deficits in Crown finance, and was partly a cause of the English Civil War,” says Smith. “The challenge to studying corruption is that it’s usually seen as a narrow problem — make sure office holders don’t abuse the public trust,” says Smith. But scholars have more recently been recognizing the need to revaluate and widen the concept of corruption, according to Smith, to take into account how corruption is perceived and interpreted across cultures. In 2014, Smith published his first book, Sir Edward Coke and the Reformation of the Laws. It was during this project that he became interested in the history of corporate reputation and responsibility. Smith wanted to trace how early modern corporations attempted to represent themselves as good citizens meeting their public interest obligations. Corporate charters often specifically set out these responsibilities and made them legal requirements. Reconstructing the history of this first corporate economy required a fresh look at many of the leading legal cases from the period when the commercial corporation emerged in England. Many of these cases had to do with corporations — though corporations during the 17th-century included cities, guilds, cathedral chapters or trading societies. Lawyers assumed that corporations had to contribute to society by providing employment, maintaining quality standards of products, and keeping their members in good order. As commercial corporations emerged, such as the Hudson’s Bay Company, these same expectations attached to them. As a result, corporate reputations for contributing to the public good mattered. Smith has recently completed an article on the Hudson’s Bay Company (HBC) in the 18th-century as a prime example of this corporate attention and sensitivity to reputation for corporate social responsibility. “HBC was challenged to defend its 1749 charter and did so by arguing that the company was training sailors who would be able to fight the French threat, knowing that this logic will appeal to British parliamentarians,” says Smith. Until 1844, even business corporations in England had to at least pretend that they were acting in the public interest. It was a key vulnerability for these companies, according to Smith. 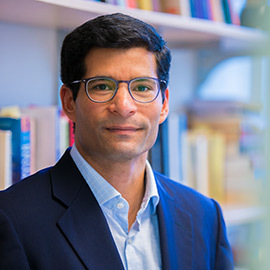 Smith hopes that this research will contribute to a larger rethinking of the historical roots of corporate social responsibility and new ways of thinking about reputation. “Reputation is still in its early days as a field of management,” says Smith.